Are you an online publisher, bloggers, digital content producer, PR representative, digital documentarian, social media consultant, marketer and/or digital influencer? 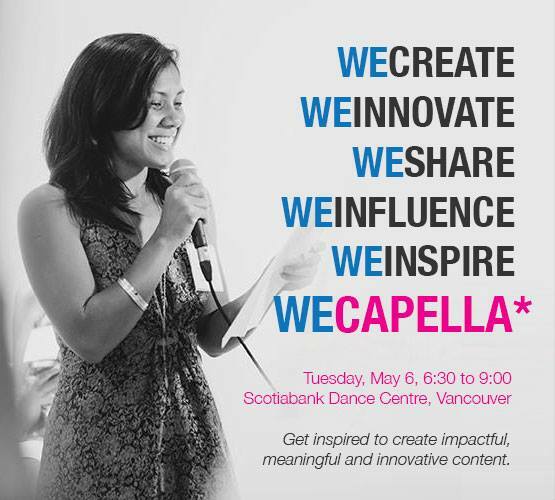 On May 6th, 2014, the inaugural WeCapella Vol. 1 event will launch at the Scotiabank Dance Centre in Vancouver. 100+ attendees will hear speakers talk about ideas that will inspire digital content creators to create impactful, meaningful and innovative content on the topics of digital video, blogging and online publishing. In the past year I have heard two of the speakers present at local events. Jaeny Baik and Marc Smith packed their presentations with tips, behind-the-scenes insight and a bucket full of enthusiasm and encouragement. I left with fresh ideas that can help to redirect and refresh my approach as I mark my ten year anniversary of publishing online this year. Weeks later I’m still thinking about what I learned while attending their talk/workshop. Even if you don’t hold any of the eight “hats” mentioned above, you might be interested to learn more about social media and what works best in this field. I applied to be one of the blog ambassadors for this event* because I have benefited from attending previous events put on by Crisp Media’s Christine Pilkington and her colleagues. The added benefit of attending their events is that it isn’t just the programme itself that you can appreciate. You have the opportunity to meet interesting members of BC’s social media community. Every person – whatever their title – has a story to tell and experience to share. This following information is presented on the WeCapella ticket site. It’s included here as well to help explain the focus of the evening. Heather Hawthorn Doyle is a multiple award-winning television producer and director (Gemini, NHK Japan Prize, $50,000 Shaw Rocket Prize, Leo Award, Silver Chris) who, in the past eight years, has developed and successfully showrun six new series and four specials for North American broadcasters, including HGTV, Animal Planet, OWN, W Network, OLN, BIO channel, Comedy, CITY, and CBC. Now with business partner Brian Adler, and their newly formed television and digital media production company Mom and Dad Productions, HHD is committed to bringing her passionate and highly visual storytelling to businesses and the digital space. Marc Smith blogs at 30 Day Adventures, which takes him to new locales and activities every day for 30 days, including working with the Marine Mammal team at the Vancouver Aquarium, to sipping wine and learning the history behind several of Langley’s vineyards – and most recently Hawaii. Marc’s desire to connect with people and his community is evident. To get involved in an adventure or series, visit www.30dayadventures.ca or follow on Twitter at @TheMarcSmith. Linda Solomon Wood is founder, publisher, and editor-in-chief of The Vancouver Observer. Winner of the 2012 Canadian Journalism Foundation Excellence in Journalism Award, and the 2010 Canadian Online Publishing Award for “Best Online-Only Articles,” The Vancouver Observer’s West Coast-centric reporting has global reach and impact, person by person, reflective of the brave new landscape of inter-connectedness. If you are interested to attend this evening event, visit the WeCapella website link shared below and let me know, via Twitter, that you’ll be going. We can watch out for each other. WeCapella event sign-up page. ($35 admission. A promo code is available. Please use VMwecapella10 for $10 off the General Admission Price. WeCapella on Facebook and Twitter. Transit notes: The event location is near Granville street and is a convenient destination for bus users. It’s a relatively short walk down to the Yaletown skytrain station as well. * As a blog ambassador I receive free admission to the WeCapella event and no compensation for this and related social media posts. All opinions shared by me about the WeCapella event are my own.